If you’ve arrived here looking for a list of topics and their new GCSE grade next to them … you’ll be disappointed. Two things arrived today that got me going “grrrrrr” so before I start let me just get this off my chest: “There is no such thing as a grade B topic, or a grade E topic … they have all been made up by textbook publishers and revision product companies”. Even if you don’t agree with me do read on, because this is worse than just saying “circle theorems is going to be a Grade 5 topic”. The examples I am going to provide you with are just plain wrong! Before I go “off on one” I need to say this IS NOT about being able to provide SLT or parents with a forecast grade – that is a massive whole other hornets’ nest. I am talking about producing lists of topics or textbooks saying that certain topics are a specific grade under the new GCSE (9-1). So let’s deal with the FACT that the current GCSE only ever had “grade descriptions” for certain grades as shown below from the spec of the current Edexcel 1MA0 GCSE – F, C and A and then people started publishing stuff (most of the textbooks and other revision resources did .. it was everywhere!) for ALL THE GRADES. This means that for the vast majority of topics any grade that it related to, was in fact just “made up” based on someones opinion and nothing more. I’ve always had an issue with this as I find it limiting too – not just for students but also for us as teachers. There are some teachers that will refrain from teaching certain topics because it’s not targeted at their student’s ability … I don’t want textbook publishers (or anyone else that gets worse results than me for a start – harsh I know! and I’m not as arrogant as that statement makes me sound by the way!) telling me what my students can and can’t access. I actually find this quite “de-professionalising” of me, as a teacher. 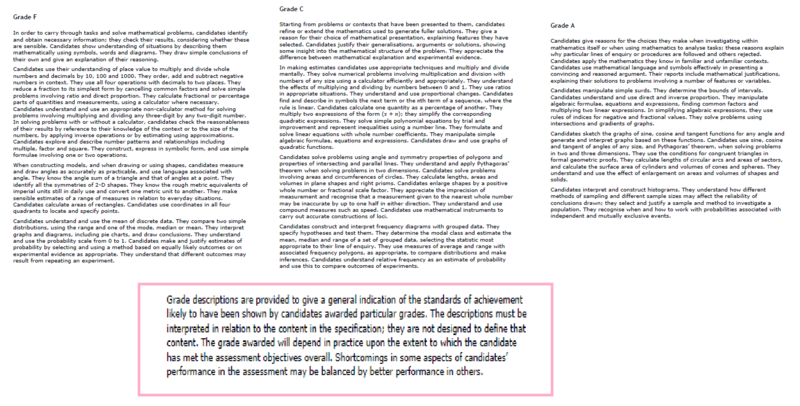 In fact according to the .gov site they developed ‘grade descriptors’ for the new GCSEs graded 9 to 1 and they are different from ‘grade descriptions’, which apply to GCSEs graded A* to G. The idea is that the descriptors “give an indication of the expected mid-point performance at grades 2, 5 and 8”. This suggests the government also (OMG I can’t believe I may be agreeing with a government policy for a change!) want to move away from this way of categorising topics. … so there you have it! These lists and saying things like “venn diagrams is a grade 3 or a grade 5” (depending on which of the two things I’ve had today!!) is just made up and I for one am not prepared to limit neither myself nor my students. People are just making shiz up and in my opinion, this is just plain wrong. I know they’ve probably used their professional judgement but doing this is not helpful to the cultural shift we need in Maths education right now and I think if people want to continue to do this and to play on the naivety of others they need to add a caveat that their grading is a gauge of difficulty in their opinion and not linked to the official grades that will be awarded at GCSE. PS: As always I reserve the right to change my mind at a later date .. on this point I can’t see it happening. 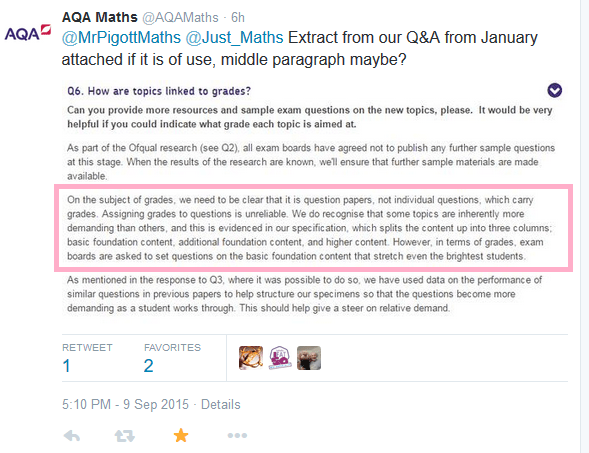 PPS: On the basis of a long and arduous discussion on Twitter earlier AQA kindly tweeted me a photo of their Q and As from January which supports the fact (as per the 2nd paragraph) that it is “it is question papers, not individual questtions which carry grades. Assigning grades to questions is unreliable”. Here here – totally agree and am often annoyed when meeting D to C grade students needing extra tutor input when they tell me they haven’t covered various topics because they are A grade or above their grade predicted! A mark is a mark towards the next grade – does not matter where in the paper it comes from or from what topic!! When will revision guides stop putting topics under grades? The grades we assign to topics currently are only approximate, but over the years they have proved useful in guiding students. We must have been in this position when CGSEs were first introduced (I’m old enough, but cannot remember!). So, all we can do now is try our best, and as time goes on we will get better at assigning new grades to topics. To be safe, if different ‘sources’ disagree we should perhaps err on the side of caution and assign the higher grade. I’d have thought there has to be some degree of assigning grades to topics as there are some topics only appearing on the higher specification? I just dont get the fascination with wanting to assign grades . .. I find it quite limiting. how can you explain then the students’ current grades on the “target stickers” that some schools insist on using if you don’t use grades when you teach? I use grades when the students do “tests” which are all past papers graded through having been sat in a live sitting with hundreds of thousands of students and not something I make up. The idea of grading specific topics goes against everything the new GCSE is meant to be doing. This is all fine, up until the point where they weight and order the paper based on these grades. So the grades do exist, they just aren’t telling us what they are. In my opinion I would rather my students know that the topic we are doing today will be early in the paper or later in the paper. 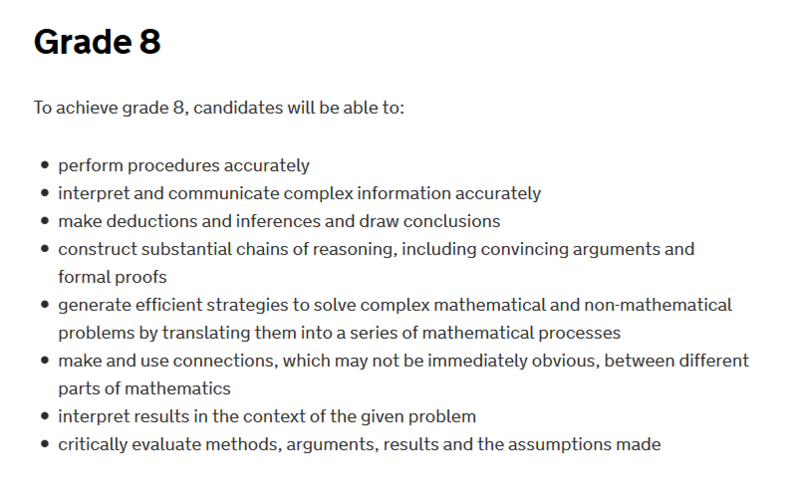 I would also like to be treated as a professional and not let exam boards tell me that I cannot know which topics they are treating as ‘difficult’ and which they are not. I find their attitude a little patronising, and it just adds to the anxiety of the first exam in 2017. I also think this ends up leading to the Pearson ‘step’ model, which seem to be designed to confuse students even more. Pearson have already stated that their 12 steps don’t equate to grades. So what is the point in them? The above link is to issue 3. I’ve had a look at issue 2 and that’s a lot different too. So I’m guessing issue 1? With you on that… Do you have a link to that old doc? I do .. I’ll post it up later. I am pleased I found this, I agree with it totally. 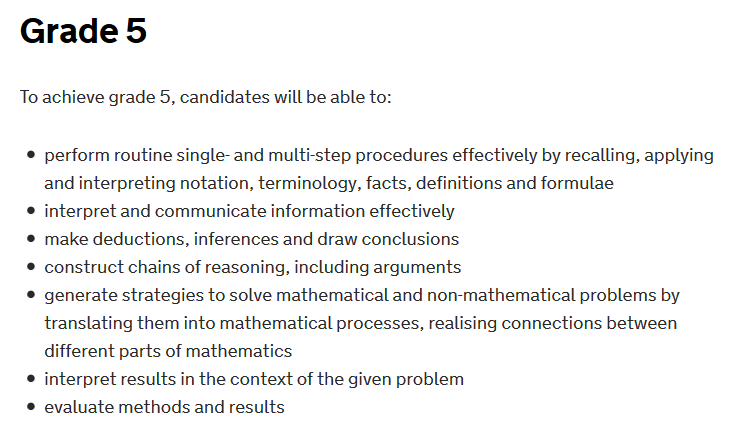 I am working with a school supporting a mathematics department and their development of the scheme of work, trying to support them moving away from a KS3 and a separate KS4 SoW (and for that matter KS5) to a five (or seven) year scheme of learning. I have been discussing how grades and flight paths become an artificial glass ceiling and the arbitrary nature of grading a question is meaningless; is the progression in the topics that is important. I would like to add simultaneous equations to the nonsense as well. I came across a set of material claiming that they were grade 6 – interesting as they are included on the Foundation tier specification. As a support teacher and private tutor, teaching borderline students, I have always tried to ignore grades allotted to topics and instead focus on a student’s strengths.Consequently if a student completely ‘gets’ substitution, we study simple substitution into expressions, through to formulae including the quadratic formula, plus functions… Similarly, if a student is very visual, then we study all statistics graphs, conversion graphs, speed/distance/time, trig graphs… I also teach a topic called ‘Tracing Paper’, covering all those things that can be done with tracing paper. Rather like vertical markets in business. So I can manage without topic grades as long as my students are taking the Higher paper – but there must be a cut-off point for the Foundation paper, ie topics which really are deemed to be Grade 6 and above which only feature on the Higher?